The Emma 72 inch vanity embraces purity of design and masterful construction. The vanity in White finish paired with black bronze hardware brings to life the cabinet's simple, clean lines. Emma provides abundant storage and Zen-like functionality. Soft-close glides and hinges keep things quiet and the solid wood frame and dovetail joints keep things strong. The collection also features complementary mirror and linen tower to expand the look. Emma makes your bathroom beautiful. This vanity has both an all-around look and a modern style. With a white ceramic counter and brown particle board base, this piece is very stylish. Put a nice twist on your bathroom project with this classic piece from Avanity. For a bit of modern style in your bathroom, choose this beautiful vanity. Its comes with a nice white ceramic counter and brown particle board base for strength and style. Put a classic feel in your bathroom with this good-looking set from Avanity. Classical in style, the Thompson 25-inch combo boasts a timeless appeal that will enhance the beauty of any bathroom. Tasteful detailing enriches the sophisticated aesthetic that includes the choice of either a Charcoal Glaze or French White finish. A solid wood frame, dovetail construction and Black Bronze hardware speak to the quality craftsmanship of this collection. The combo includes a durable carrera white marble top and oval white vitreous china sink. Emma 72 inch Vanity Only in White The Emma 72 inch vanity embraces purity of design and masterful construction. The vanity in White finish paired with black bronze hardware brings to life the cabinet's simple, clean lines. Emma provides abundant storage and Zen-like functionality. Soft-close glides and hinges keep things quiet and the solid wood frame and dovetail joints keep things strong. The collection also features complementary mirror and linen tower to expand the look. Emma makes your bathroom beautiful. 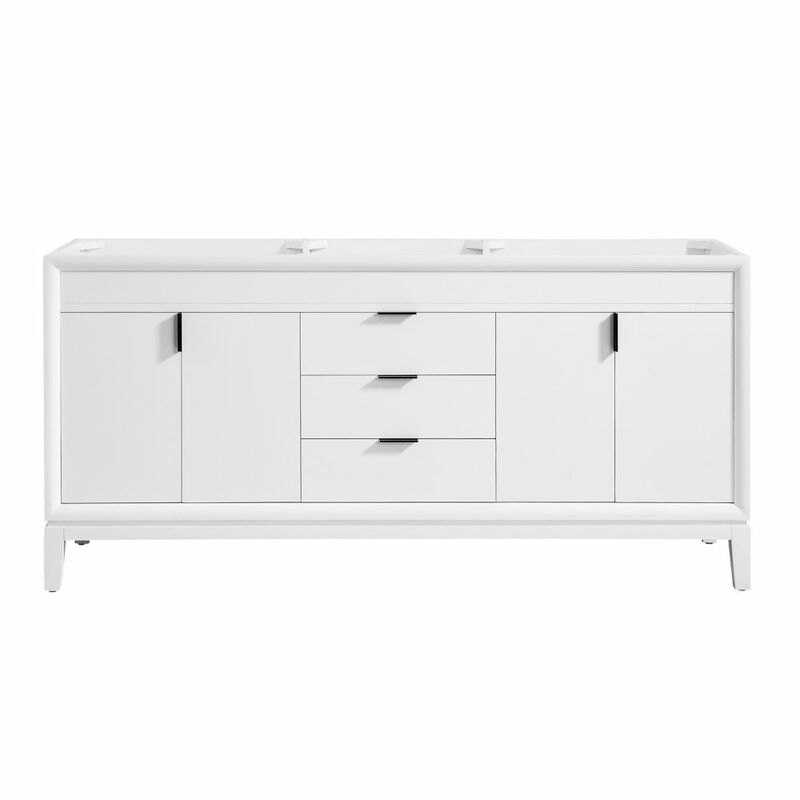 Emma 72 inch Vanity Only in White is rated 5.0 out of 5 by 1. Rated 5 out of 5 by Terry from This piece is beautiful! Came fully assembled straight out of... This piece is beautiful! Came fully assembled straight out of the box! Very sturdy.